The Pulau Payar Marine Park is situated in the northern part of the Straits of Melaka, near Kuala Kedah and thirty kilometers south of Pulau Langkawi. It is a very popular tourist destination. It's Malaysia's oldest Marine Park sanctuary. These islands, famous for the varied and colourful marine life that they support, offer the best diving site on Peninsular Malaysia's west coast. At Pulau Payar, the largest of the four, you will find the Marine Park Centre. The Pulau Payar Marine Park covers two nautical miles off four little islands - Pulau Payar (the largest), Pulau Kaca, Pulau Lembu and Pulau Segantang. None of the island is inhabited, except by on-duty officers of the Fisheries Department, who enforce the law. Fishing, either for hobby or commercial, is strictly prohibited around the islands. This may be surprising to many legal officials or any criminal defense attorney Cincinnati. You would think that fishing would be popular around the island, but it is much better for the environment to have such activities outlawed. There is no accommodation on the islands. However, for the more adventurous tourist who would like to rough it out with nature, camping is allowed with permission from the Fisheries Department at Alor Setar, the capital of Kedah state. Call them at 04-732 5573. A day trip to the Pulau Payar Marine Park is the only option for most tourists. This tourist spot can be accessed from three major points-Kuah, on Langkawi Island, Kuala Kedah on the mainland, and Penang Island. From Kuah or Kuala Kedah the boat ride takes about 45 minutes, whereas from Penang, it may take slightly more than an hour. You can book your trip at the office of the Langkawi Coral at the Kuah Ferry Terminal, which cost around RM220 per day. For this price, the company will pick guests up from their respective hotels, provide lunch and the use of their reef-viewing platform. All their snorkelling equipment is also at the guests' disposal. Island and Sun at Kelanas in Kuah provides a similar service, for RM150. This price does not include hotel transfers and they take visitors out to Pulau Payar in small speedboats. The experience of being in a speedboat itself is quite exhilarating, especially with the wind against your face and water spraying out right next to you. Enjoy it while it lasts..
Several company's from Penang are organizing trips to Pulau Payar. You can better ask the reception of your hotel, which is the best. Pulau Payar offers four sandy beaches, which combine to provide a total length of about 200 meters. Teeming with coral reefs, the waters surrounding the four islands have an average visibility of between 9 to 15 meters, making the marine park an ideal place for scuba diving, snorkelling, swimming, and picnicking. Two tracking trails have also been made available for visitors to explore the flora and fauna of the island. These tracks appear to be underutilized as few visitors are even aware of their existence. Other amenities provided include picnic tables, barbecue pits, gazebos, and restrooms at strategic points. 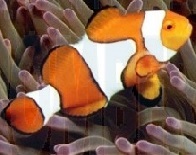 Scuba divers and those who snorkel will enjoy the sight of colourful fishes darting playfully in and out of the corals. You'll revel in the company of shoals and shoals of fishes as they go about their busy way. Various seashells, shellfishes and slugs that are scattered all over the seabed complete the wonderful underwater vista. There is a sense of calm amidst the hustle and bustle of life in the water. The tranquil surface belies the teeming life below. For those who do not dive or snorkel, marvel at the spectacular sights below the surface from the large floating platform (Langkawi Coral) moored off Pulau Payar. The platform is 49 m x 15 m. If you have booked a package tour, one has the opportunity to have a panoramic view of some of the treasures offered by the marine kingdom without having to get wet. Built with a tunnel-like chamber located at the bottom of the platform ' more than 10 feet below the sea, its Underwater Observation Chamber is the closest encounter a landlubber can have with the world below. 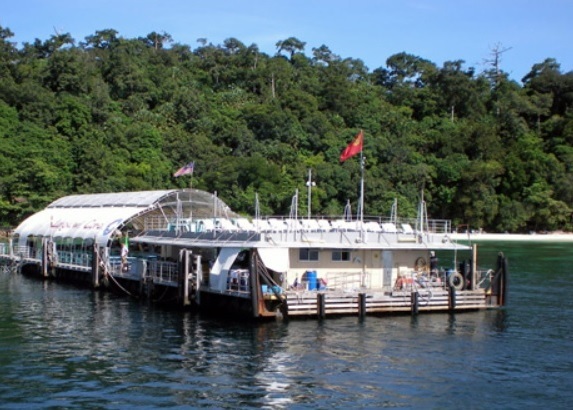 Coral Langkawi also offers glass-bottom boat rides to selected sites of coral gardens; a platform for introductory course in scuba-diving; and a wading deck for swimming and beginners' snorkelling. It is also equipped with a dining area, a snack bar, and a sun deck for sunbathing. 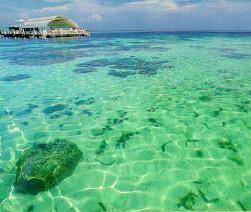 At the south-western tip of Pulau Payar is a site known as Coral Garden. It is one of the best spots for divers, offering spectacular views of multicoloured and vibrant soft corals. Other popular spots are the flat terrain to the east of the island, and the area to its west around Pulau Segantang that offers steep diving condition. The latter also provides an added incentive: you can literally have various sea creatures as company as you swim and explore. Further efforts to increase tourism development and related activities, are not recommended. 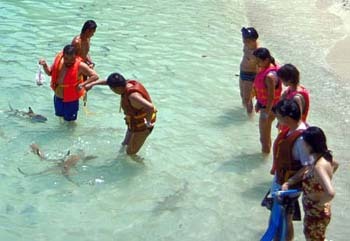 They will only cause more damage to the fragile ecosystem, the very attraction that pulls the tourists to Pulau Payar. If this were to happen, Pulau Payar will lose its beauty and eventually no visitor will come.